These lovely big cushions are from a Banjara bag. The Banjara are a semi-nomadic ethnic group in India, who are well known for their needle work skills and their recycling of old textiles into beautiful quilted items using dense kantha stitching. They often use cowrie shells and mirrors to decorate their handiwork. The face fabric is a very old block print in indigo and madder red that is now faded. 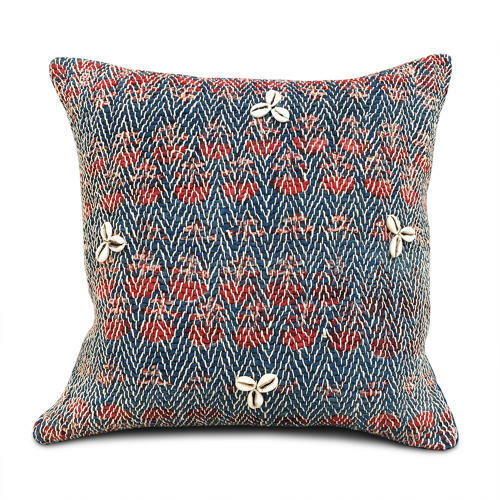 The cushions are backed with a complimentary indigo vintage hemp which has been dyed using natural ingredients. The cushions have zip fastening and feather pads.